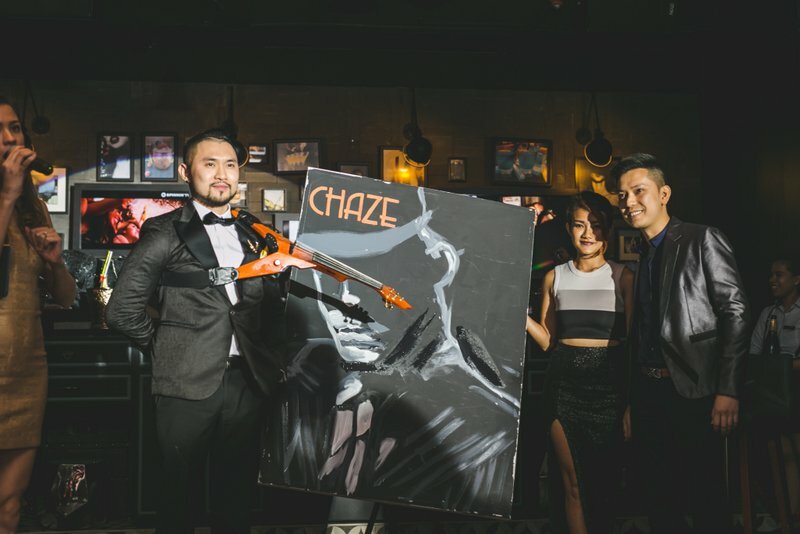 CHAZE was launched with a 2-night affair themed as ‘Loosen Your Tie’; with exclusive invitations to media, local celebrities and VIPs on 15th January 2016 and an open launch on 16th January 2016. Approximately 400 guests turned up both nights despite the pouring rain, thunder and lightning. On 15th January, the guests were entertained by dance performances – from smooth hip hop salsa fusion dance to a contemporary salsa dance where guests were wowed by flying stunts and floor tricks. Nadia Heng, the former Miss World Malaysia wasthe ideal fit for the event as she was a brilliant emcee. The highlight of the night was Dennis Lau’s performance where he had the audience spellbound with his electric violin tunes. He started his performance with the cover of ‘Writings on the Wall’, followed by a performance of his self-composed ‘The Journey’ with speed painter Haze Long who gave the audience a sneak peek on Chaze (the persona) through her painting, and ended with an upbeat cover of ‘Love Never Felt So Good’ combined with an impromptu dance accompaniment by Cecilia Yong (winner of ‘So You Think You Can Dance Malaysia’). DJ Eva T, known for her hot mashups of contemporary electro house beats; got the party pumped up to end the night. The momentum sustained on 16th January for the open launch where Shot Pong was a hit (pun intended) with the guests! In appearance it may look easy, but those who tested their aims agreed that it required a great deal of skill and a little luck to win the free shots! DJ NIKKI, being renowned as No.3 Hottest Female DJ in Asia 2013 and Top 10 DJs in Malaysia year 2014; spun the decks where her electrifying live set made the dance floor go wild. This entry was posted in News and tagged bar, chaze, lien hoe, mgroup, speakeasy, whisky bar by TheGoodGoodGuy. Bookmark the permalink.